The flavors of this dressing blend with just about anything you want to put into a salad. This extremely simple salad dressing consists of three ingredients, and is so simple that you’ll find yourself saying, “Bless that Deer Pond Gardens” place! 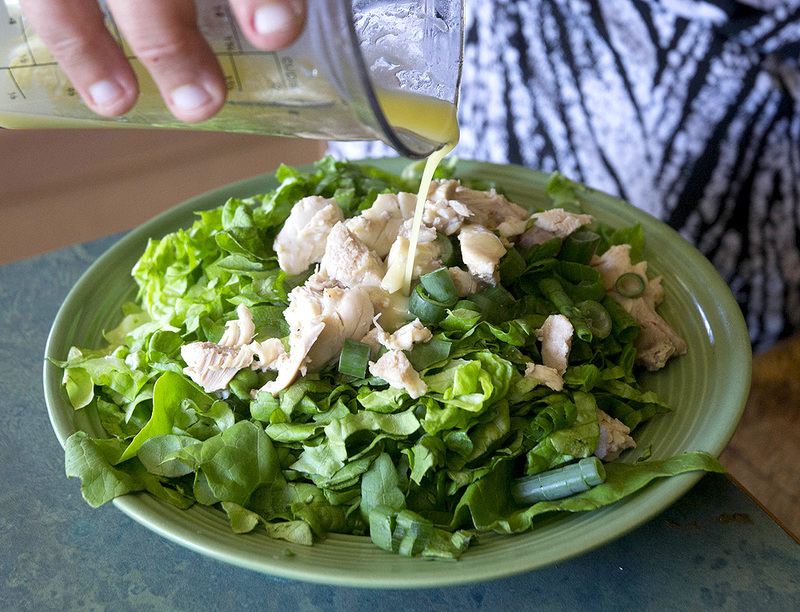 This simple salad dressing is really, really, easy. What makes it even easier is the use of stick, or immersion blender, but if you just have a fork and good wrist, you can whisk briskly and emulsify the oil with the lemon juice. You know, it takes me more time to talk about this recipe than it will for you to make it. Dress it gently over fresh salad greens — if you’re in the Dayton, WA, area, pick up those greens from Deer Pond Gardens at the Saturday Farmer’s Market or at Deer Pond Gardens (see our About section). Using an immersion blender — I’ve tilted the container so you can see better; generally, I keep the container flat. Make sure to unplug the blender the moment you’re not using it. The blades are sharp. 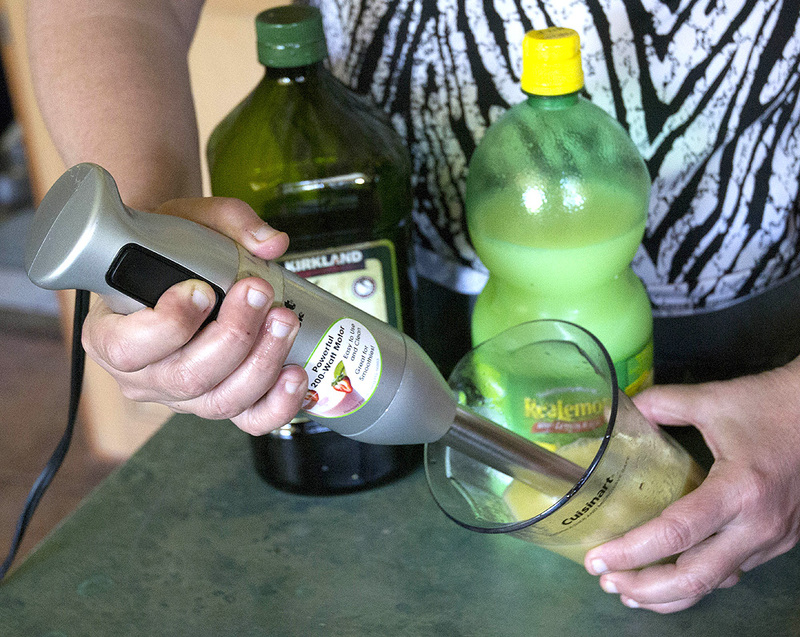 In a mixable container, pour in lemon juice and olive oil, add sugar. Blend with immersion blender until creamy and emulsified, or whisk together with a fork until blended. That’s it. See you at the Farmer’s Market. Three Horses, original oil painting on canvas panel by Steve Henderson of Steve Henderson Fine Art. Looks delightful and light. Must try. It is delightful, lemony, and versatile. Bon appetit! What a lovely simplistic dresssing! It is, Jennifer — very quick and easy, important elements when you have enough time, but want to eat well! Great post! I’m happy to bump into you via Show & Share Wednesday. I never experienced the wonders of an immersion blender until our daughter, a chef, showed me. Now I can’t give the thing up (even though it’s, um, hers). I’m all about simple recipes! Call for directions on how to get here, as well as to order produce customized for your table.